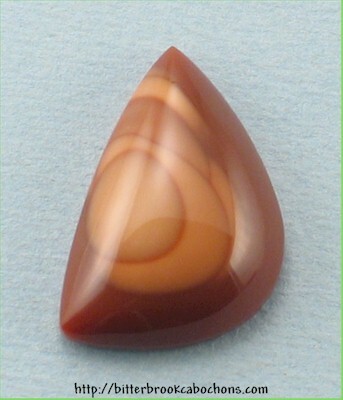 This dainty Bruneau Jasper cabochon is fairly thick; the orbs you see disappear before getting to the back of the cab, so I left it thick so I would not grind off the orbs during shaping. Nice multi-shaded orbs in a toffee-colored matrix. 26mm x 18mm x 7mm. Weight: 22.15 carats. Do you like Bruneau Jaspers? Click here to see all of the Bruneau Jaspers on the site! You are visitor number 34 to this page this year.